Scene setting: Karl Lagerfeld began designing for Fendi in 1965 and before his death at the age of 85 earlier this week, he had been at the creative helm of the brand for 54 years. It’s an unbelievable feat considering the musical chairs of designers we see taking the lead at luxury houses today. Lagerfeld famously designed the ‘FF’ double logo and pushed Fendi’s innovation in fur, integral to the Roman house. The stage setting of its A/W 2019 collection, the last of which Lagerfeld designed, alongside Silvia Venturini (the duo began collaborating in 2008), was a homage to him. Above the runway entrance, his handwriting was featured in the scrawled signature ‘love Karl’, and on the catwalk, a shimmering carpet was emblazoned with the italic ‘Karligraphy’ logo, which he designed in 1981. 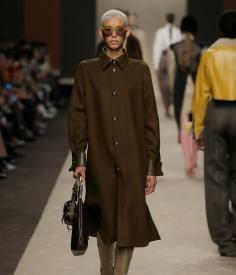 The show’s soundtrack offered an auditory narrative of Hamburg-born Lagerfeld’s incredible career trajectory, opening with Lou Reed & John Cale’s Small Town, and closing, emotionally with David Bowie’s Heroes. Mood board: The opening look – a chestnut double-breasted blazer worn with a shirt with a huge bow – was an ode to Lagerfeld’s aesthetic. His signatures populated the collection, like long collars and strong tailoring. Neutral tones were offset with daffodil, azure and fuchsia. Knife pleat skirts and wide tailored trousers were smart, and demure knee skimming dresses were imagined in diamond detail layers or sexier lattice cut-outs.